At Murphy, Taylor, Siemens & Elliott P.C., we believe in personal attention, preparation and dedication; the combination of which leads to getting results. As a team of talented and caring individuals, our main focus is helping the members of our community in times of crisis and need. If you want lawyers that care enough to personally invest in your case, you have come to the right place. We are here to guide you through the legal problems you're facing. OUR ATTORNEYS AT MURPHY, TAYLOR, SIEMENS & ELLIOTT P.C. AGGRESSIVELY DEFEND THE CLIENTS’ BEST INTERESTS IN AND OUT OF COURT. We understand all the legal nuances of Family Law, Personal Injury, Real Estate, Crop Dispute or Corporate Law cases and we know when pursuing settlement, mediation and other alternative dispute resolution methods are a better option for our client. In every case, our firm seeks the most cost-effective, expedient way to deliver the most favorable outcome. We always consider both the most immediate relief available and the long-term significance of our recommendations when we advise our clients about their options. Our decades of experience has allowed us to become highly proficient in representing Missouri residents in a number of legal areas. Our trial team has built a reputation as trustworthy, effective advocates for our clients. What matters most to us is that we provide sound, reliable, and successful guidance to our clients when they come to us for help. We strive to reach the best outcome possible in every trial, mediation, arbitration and settlement, and we have the experience and dedication to achieve results. We expertly navigate the constantly evolving legal landscape and proudly advocate for our clients in a wide range of disputes, from simple probate issues to complex family law matters, personal injury suits and more. If you need legal assistance, please do not hesitate to reach out to our team of compassionate and skilled legal professionals. Call us locally at (816) 364-6677. "5 Stars +!! Murphy, Taylor, Siemens, & Elliott P.C. represents it's clients in the way the client wishes to be represented. 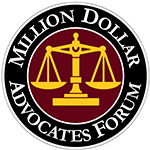 They listen and work with you to determine the best business and legal course of action." "We have worked with Ken Siemens for many years. Integrity and Honest are just a couple of words I would use to describe him and his law practice." "People may tend to stereotype lawyers, but it would be an error to do so with this firm. Everything I've seen and felt thus far points to a group with fairness and my best interests at heart." "We have had Ken Siemens and MTSE represent us for several years since our company's inception. Their integrity, honesty, professionalism and knowledge of the law is of the highest caliber." "It was a blessing to have an attorney that was truly happy for our family and to be a part of our experience. I cannot thank Mike enough for everything he did." "I was referred to Joe Elliott by a relative and everything went great. Joe was easy to talk to and answered all my questions. He was professional and very knowledgeable." "I have never worked with a better law firm. They are very professional, capable, and fair!!" 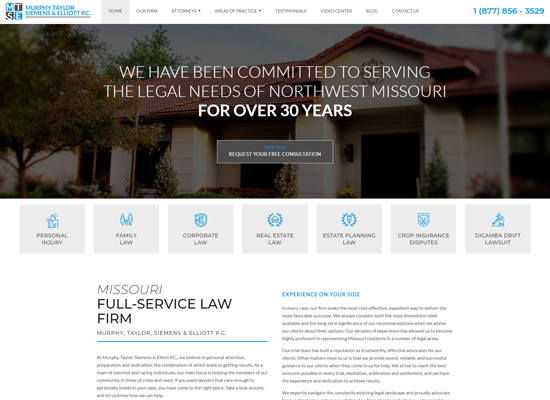 "One of the most thorough and professional firms I have utilized. They have represented our company in many areas of law and have always exhibited extreme competence and care for the client." "My husband and I worked with Ben Creedy for crop insurance and I highly recommend him. Ben is great to work with and is very knowledgable on how crop insurance policies work." At Murphy, Taylor, Siemens & Elliott P.C., we are a full-service law firm, meaning we are prepared to take on almost any case. In particular, we focus on Personal Injury, Family Law, Corporate Law, Real Estate Law, and Estate Planning & Disputes. If you’ve been hurt or wronged in any way, don’t settle for pain and bitterness. Let us assist you in recovering the compensation you rightly deserve. The full-service law firm of Murphy, Taylor, Siemens & Elliott P.C. formed in 2002 out of the unified vision of Ed Murphy, Mike Taylor, Ken Siemens, and Joe Elliott. It is founded on personal relationships and achieving top quality legal results for its clients. With more than 100 years of combined legal experience between the partners, there is a healthy amount of confidence that can only come from numerous courtroom victories and successful settlements for clients. While it seems most lawyers are only focused on looking out for themselves, the attorneys at Murphy, Taylor, Siemens & Elliott P.C. are active in a variety of different areas of the community. That’s because they believe in giving back in more ways than one. Without a proper understanding of the community and the individuals that make it up, it’s impossible to serve it well.